31 photos of this steam-worked metre gauge coal-carrying line in the state of Santa Catarina, southern Brazil. Including branches it is 164km long, and runs from mines in the south of the state north through Esplanada, Tubarao, its operating centre, and then Capivari to the port of Imbituba. The section north of Capivari was reported out of use in 2012; the rest was dieselised. Tubarao depot. Dona Teresa Cristina Railway, Brazil, 21 October 1976. 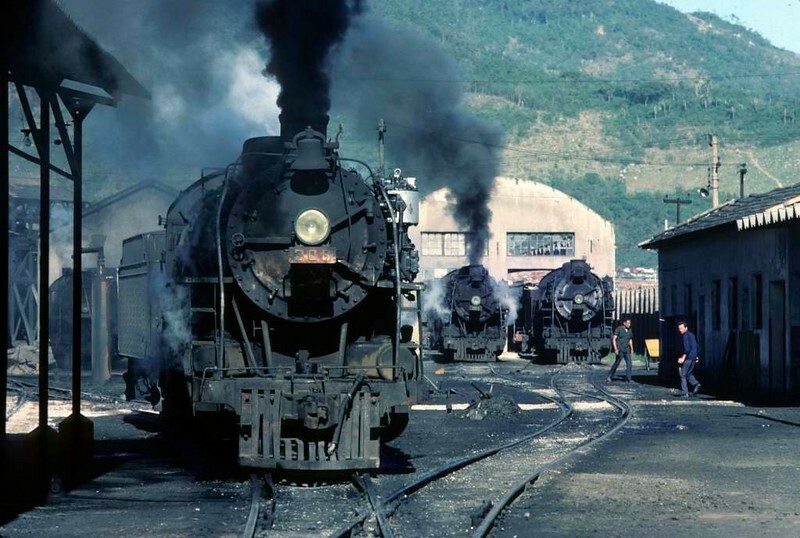 Three of the massive 2-10-4s including 308 (Baldwin 62359 / 1940). The DTC had 14 of these locos. Weighing 158 tonnes they were probably the biggest locos ever to run on metre gauge tracks. They came to Tubarao second hand, like most of the railway's locos. Photo by Les Tindall.